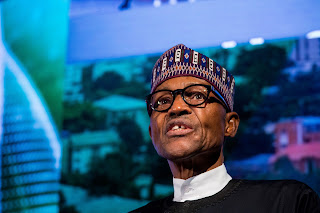 LAGOS, NIGERIA (BLOOMBERG) -- Samuel Okunola shares the frustration of many Nigerians with the man he voted for three years ago, President Muhammadu Buhari. The 52-year-old tailor no longer feels he can support him in elections next year, but he doesn’t see an alternative. Time is running out for that person to emerge, with elections due in February. However much Buhari’s APC takes the blame for overseeing the most severe economic slump in 25 years, failing to end security threats such as the Boko Haram Islamist insurgency and being unable to end daily power cuts and fuel shortages in Africa’s biggest oil producer, there’s no sign of a significant threat from the opposition. While Buhari, 75, hasn’t said if he’ll seek re-election, he will start the race with a clear advantage unless opposition parties in Africa’s most populous nation find their champion soon. The main challenger to the president’s All Progressives Congress should be the People’s Democratic Party, which remains scarred by a reputation for incompetence and corruption that led to its ouster from power in 2015. Part of the PDP’s challenge is that it ran Nigeria since the end of military rule in 1999 until its defeat three years ago and left behind most of the seemingly intractable problems that the Buhari administration now faces. “The PDP’s main problem is that it has not been able to shake the perception of a fundamentally corrupt party built on rent-seeking,” said Amaka Anku, head of Eurasia Group’s Africa Practice. PDP spokesman Kola Ologbondiyan said the party is meeting with voters across the nation and is confident that it will win support. New movements have emerged in recent months that reject both main parties. Former President Olusegun Obasanjo is touting the Coalition for Nigeria, the Nigerian Intervention Movement is headed by human-rights lawyer Olisa Agbakoba, and the Red Card Movement is led by Obiageli Ezekwesili, a former minister and ex-vice president of the World Bank. Yet for a so-called third force to organize a successful campaign across 36 states is a tall order. “It doesn’t seem other opposition parties have developed the necessary mechanisms at a national level to contest the dominance of these two parties for the time being,” said Imad Mesdoua of London-based Control Risks Group. So the vote may be a straight fight between the PDP and the APC. The PDP will probably choose a Muslim northerner as its candidate like Buhari in a bid to splinter the regional vote that went to him in block vote in the last contest when he faced Goodluck Jonathan, who’s from the mainly Christian south.